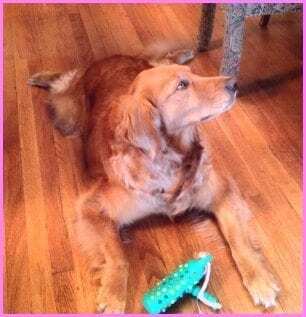 Choo Choo #5190 - Yankee Golden Retriever Rescue, Inc.
Choo Choo was 5 when her family could no longer keep her. They had recently had a baby, among other changes, and the demands on their time and finances became too much. Choo Choo was described as the friendliest dog, who loved everyone she met. She was spending most of her time alone, however, and her family decided to let YGRR find her a home where she would get the attention her family wanted her to have. Choo Choo was 106 pounds when she arrived at our vet. She had a minor ear infection, and she was reported by her owners to have some lameness at times. We immediately placed her on a weight loss regimen. We also placed her on a joint health supplement to help keep her as mobile as possible. Choo Choo needed to go for gentle walks only, and we were careful not to overdo it to keep her from injuring herself. Choo Choo was a little shy when she first arrived, but she quickly got used to the routine and staff. Choo Choo had a wonderful personality. She loved to carry and play with toys whenever she was in the home simulation room. She was extremely affectionate, leaning into people for attention, and it didn’t take long for her to charm everyone she met! We knew this special girl needed a very special home. 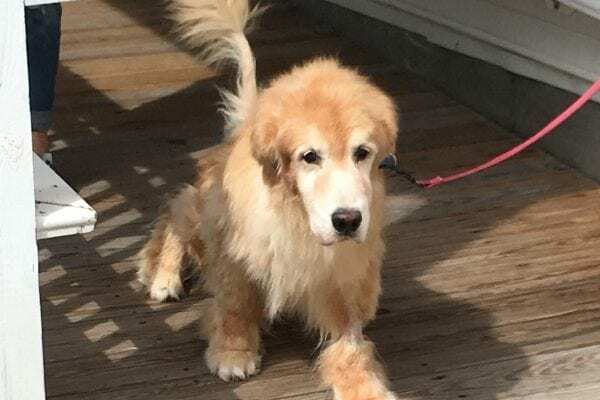 Repeat adopters who had recently lost their Golden, Maggie, YGRR #4832, were anxious to offer another Golden a permanent new home. We knew they would give Choo Choo the care and attention she needed. Choo Choo now has the forever home she deserves. Her adopters have continued her weight loss regimen, and she is now a svelte 76 pounds. They are very careful to not let her injure herself, even lifting her out of the car onto the pavement so she doesn’t risk hurting her knees. Choo Choo loves to cuddle and adores her new family. She loves to be brushed and she has plenty of new toys. She goes for daily walks on the beach, as well. Choo Choo has the life that every dog deserves, and her adopters recognize how special their new girl is. They love every Golden minute they spend with her! Choo Choo thanks you for your support. Choo Choo needed a little time to adjust and to get her on the right path for her health. Obese dogs are in danger of injuring themselves, especially their knees, and we were very careful to make sure Choo Choo lost weight safely. We knew she needed a home that was committed to her needs and would be patient as she got to know her new environment, as well. Your commitment to YGRR makes it possible for Choo Choo and all the dogs here at Riverview to get the TLC and medical care they need and to be carefully matched to the perfect new home. Choo Choo and all the Rescue dogs thank you and send big wags and kisses your way!